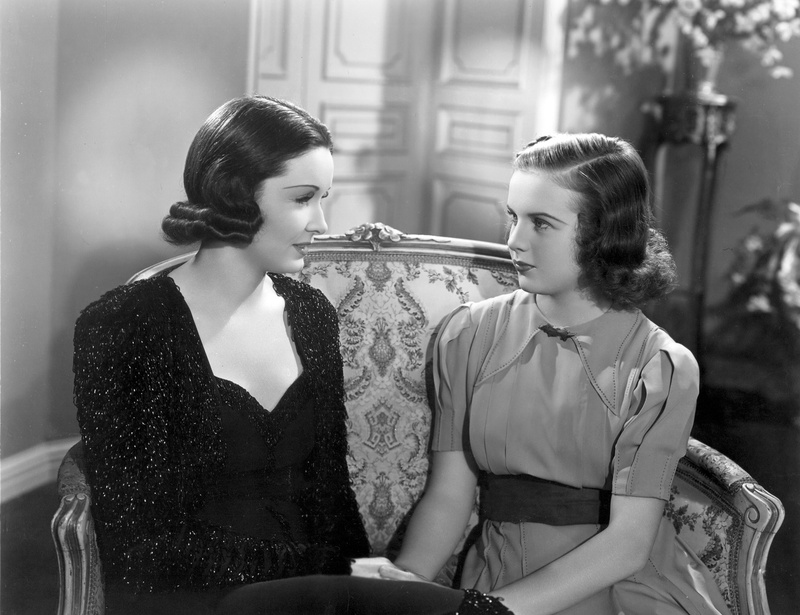 Classic Movie Man: Mad About Deanna Durbin in "Mad About Music"
This post is part of the 2016 O Canada blogathon hosted by Ruth of Silver Screenings and Kristina of Speakeasy. Anyone who has visited my blog or follows me on Twitter or read my entry in last year’s O Canada Blogathon, is aware that my love for Deanna Durbin knows no bounds. Besides her beautiful voice, Winnipeg’s Golden Girl had a natural screen presence that made her appealing to just about everyone attending the movies in the late 1930s. Mad About Music (1938) was Durbin’s third feature film. It’s also one of her most enjoyable vehicles, featuring many familiar faces in supporting roles. In Mad About Music, Durbin plays Gloria Harkison a student at a girls-only boarding school in Switzerland. Gloria’s mother is the famous movie actress Gwen Taylor (Gail Patrick). On the advice of her manager Dusty Turner (William Frawley), Gwen keeps the fact that she’s a widow with a teenage daughter a secret. Because Gloria can’t reveal her mother’s true identity, she invents a globetrotting explorer father who writes her letters and sends her photographs of his exploits. Of course Gloria writes the letters herself. She reads them out loud to her schoolgirl friends, much to their delight, except for the leader of the mean girls, Felice (Helen Parrish). Felice thinks that Gloria is a fake and that she’s been lying about having a father. Felice makes it her goal to expose Gloria as a liar. Gloria, on the other hand, is desperate to keep the tales of her “father” alive. Her desperation turns to inspiration as she enlists the help of an unsuspecting traveler. Richard Todd (Herbert Marshall) is a composer on vacation in Europe who has planned a five-day stay in Switzerland, traveling with his private secretary and valet (Arthur Treacher). Richard has no idea the turn his life is about to take when he runs into Gloria at the train station. Gloria tells her roommate and best friend Olga (Marsha Mae Jones) that her father is arriving for a visit by train. Gloria asks Olga not to tell anyone, but Olga lets the cat out of the bag and not only is Gloria at the train station meeting her “father,” but all the girls from her school are there, including arch nemesis, Felice. With a bouquet in her arms, Gloria picks Richard out of the train passengers. She tells Richard, that “it’s an old Swiss custom to greet the most distinguished looking visitor on every train.” To keep the ruse alive, while her schoolmates are watching, Gloria insists on taking Richard to his hotel. By escorting Richard into the hotel, right up to the elevator, Gloria convinces her friends that Richard is her father. In the midst of Gloria’s subterfuge, she has a puppy-love romance with Tommy, a cadet from a nearby boys academy. While she’s pretending to be Richard’s daughter at the train station, Tommy is waiting for Gloria at a local sweet shop where he asked her out on a date. Gloria arrives late for their date due to meeting Richard at the train station and transporting him to the hotel. Tommy gives Gloria a huge box of chocolates which she brings back to school, telling her pals they’re a gift from her father. When Annette Fusenot (Elisabeth Risdon), one of the instructors/administrators at the boarding school, hears that Gloria’s father is visiting, she and her sister and colleague at the school, Louise (Nana Bryant), invite him to luncheon. When Richard arrives at the school, he is determined to set the record straight and expose Gloria’ big lie. As he enters the school and sees the lineup of Gloria’s classmates to greet him, he changes his mind. Being the sophisticated and debonair man that he is, the girls are enthralled with “Mr. Harkinson’s” tales of adventure. Felice even seems to be coming around due to Richard’s graciousness and charm. Herbert Marshall and Durbin entertain her schoolmates. Gloria’s happiness comes to an end when Richard leaves for Paris. After losing her “father,” Gloria is longing to see her mother, who is currently in Paris on a publicity tour. Determined to visit her, Gloria runs away from school, boarding the same Paris-board train that Richard is on. Without a ticket, the train’s conductor locks Gloria in a small room. She tells the conductor that her father is on the train, but he doesn’t believe her. To get Richard’s attention, Gloria starts singing, which draws a crowd and eventually Richard who tells the conductor that she is indeed his daughter. Dusty Taylor tries to keep Gloria away from her mother fearing it will be the end of her career as a movie “glamour girl.” Richard is determined that Gloria gets to visit her mother by barging into the press conference she is having at her hotel. Upon seeing Gloria with Richard, Gwen tells the crowd of reporters that she has a 14-year-old daughter. At first, Gloria doesn’t want to acknowledge this fact, but when she sees that her mother wants it this way, she breaks down in tears and the two embrace. Through all the confusion, it now appears as though the family has been reunited and that includes Richard! So of course, Gwen and Richard become a couple and Gloria not only has her mother back in her life, but a father too. Mad About Music is an example of the Hollywood studio system at its best. Even with Durbin’s obvious talents, it took the geniuses at Universal to package just the right vehicles for her. Her first producer and mentor, Joeseph Pasternak (he produced 10 of her films, all at Universal) realized that Durbin was a true star and helped develop her God-given talent. It’s no secret that Durbin was unhappy toward the end of her film career, complaining that her roles were awful, even though she was still popular with moviegoers and was one of Hollywood’s highest paid actresses. After retiring, she resisted every attempt to lure her back into the spotlight. When Pasternak moved to MGM, he practically begged Durbin to come with him. She surely would have benefited from the strong musical units at that studio, but she would not be tempted. Instead she lived the rest of her days in relative obscurity in a small town outside of Paris, France. Deanna Durbin is known for having a beautiful voice, but her movies aren’t typical musicals, but rather movies with music. Mad About Music is no exception. In between escapades, Durbin sings three new songs: “I Love To Whistle,” “Chapel Bells,” and “A Serenade to the Stars.” She also sings “Ave Maria” with the Vienna Boys Choir, although the boys seen singing on screen were members of Saint Luke’s Church choir of Long Beach, California. Helen Parrish, Durbin, and Marcia Mae Jones ride (and sing) through the Swiss countryside. Herbert Marshall was still considered a leading man in Hollywood at the time of Mad About Music’s release. Ironically, he played the “husband” of Margaret Sullavan in The Good Fairy in 1935. Sullavan’s character picks his name out of the phone book at random and tells a lecherous meat packer, played by Frank Morgan, that Marshall’s character is her husband to avoid his advances. Durbin celebrates her sweet 16 birthday with Arthur Treacher, Marshall, director Norman Taurog, and producer Joe Pasternak. Marcia Mae Jones who plays Durbin’s best friend would be the head of the mean girls in the Shirley Temple feature, The Little Princess, the next year. Helen Parrish was to Durbin what Jane Withers was to Shirley Temple. Parrish also played Durbin’s rich, stuck-up cousin in First Love. Parrish could also be a good girl, playing one of Durbin’s older sisters in Three Smart Girls Grow Up. In reality, Durbin and Parrish were the best of friends. Arthur Treacher made a career playing butlers in the movies, including this one and several he made with Shirley Temple. Jackie Moran, who played Durbin’s romantic interest in Mad About Music was discovered by Mary Pickford. After appearing in Mad About Music, Moran had a small part in Gone With The Wind, playing Doctor and Mrs. Meade’s younger son who wanted to join the Confederate Army so he could “kill all the Yankees” to avenge the death of his older brother. He and Marcia Mae Jones starred in several films for Poverty Row studio Monogram Pictures. In 1944, he exchanged flirtatious glances with Shirley Temple in Since You Went Away. William Frawley had a long show business career, that includes classic films like The Farmer’s Daugher and Miracle on 34th Street, but is best known today as Fred Mertz in the TV classic I Love Lucy. Elisabeth Risdon and Nana Bryant who play sisters and teachers Annette and Louise Fusenot, respectively, were in the screwball comedy classic Theodora Goes Wild two years earlier. Risdon played Irene Dunne’s Aunt Mary. Bryant played Ethel Stevenson, the wife of Dunne’s publisher, . Gail Patrick had played mean women in movies like My Man Godfrey and Stage Door, but gets to play a loving, if conflicted mother in Mad About Music. Rarely a sympathetic character in her early film roles, Patrick shows her versatility with her brief, but warm portrayal. Sid Grauman appears as himself in Mad About Music. In the film he says he’s saved a space for Gwen Taylor’s (Gail Patrick) hand and footprints at the Chinese Theater. In reality, it was Durbin who would have her hand and footprints memorialized in cement at the famous theater for Mad About Music’s premier.